Aero Precision's M5 Stripped Receiver set is engineered to match flawlessly, providing the operator superior performance and accuracy in a durable and dependable platform. The upper receiver features M4 feedramps, DPMS High Profile (.210) Tang, and .2795 takedown pin holes (DPMS size). The lower receiver features a rear takedown pin detent hole which is threaded for a 4-40 set screw, bolt catch that is threaded for a screw pin (no roll pin needed), and a integrated trigger guard. It works with standard DPMS 308 components and magazines, and accepts Battle Arms Development short throw safety selectors, but will work with any standard selector. 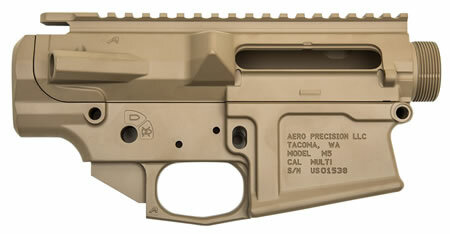 Both the upper and lower receiver have a Magpul FDE Cerakote finish and are machined from 7075-T6 forged aluminum.